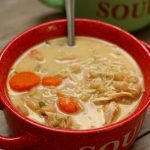 Slow Cooker Chicken and White Bean Soup–dried navy beans are slow cooked with onion, garlic, spices, carrots, celery and chicken (or you can use turkey). You can make it creamy or dairy free (it’s up to you). 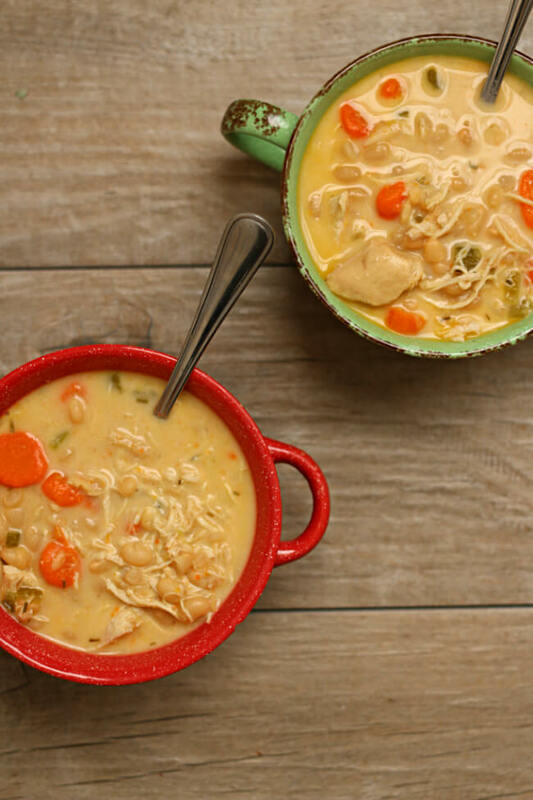 For cold nights this soup is a 10 out of 10! Chicken or Turkey–for this recipe you can use cooked chicken or turkey or uncooked chicken. It’s totally up to you. I used uncooked chicken breasts. You can also use uncooked boneless, skinless chicken thighs. If I used cooked chicken/turkey I would add it in after the beans have cooked so that it doesn’t get stringy and overcooked. 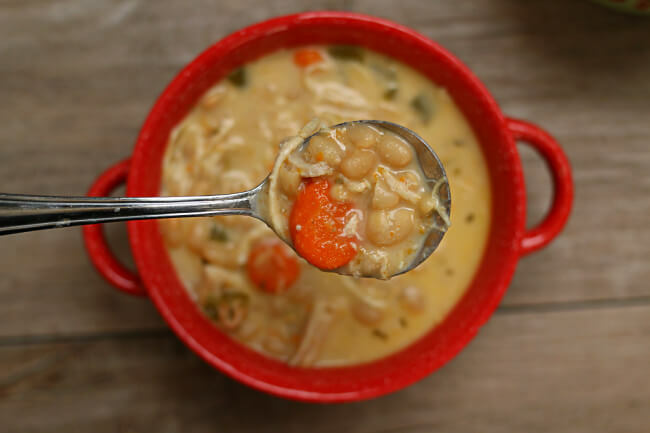 To make Slow Cooker Chicken and White Bean Soup I used my 6 quart oval Kitchenaid slow cooker. * I love this slow cooker. It cooks low and evenly. I love the medium heat choice because most slow cookers that I’ve seen only have the option of cooking on low or high. If you’re going to buy just one slow cooker, this is the one that I recommend. 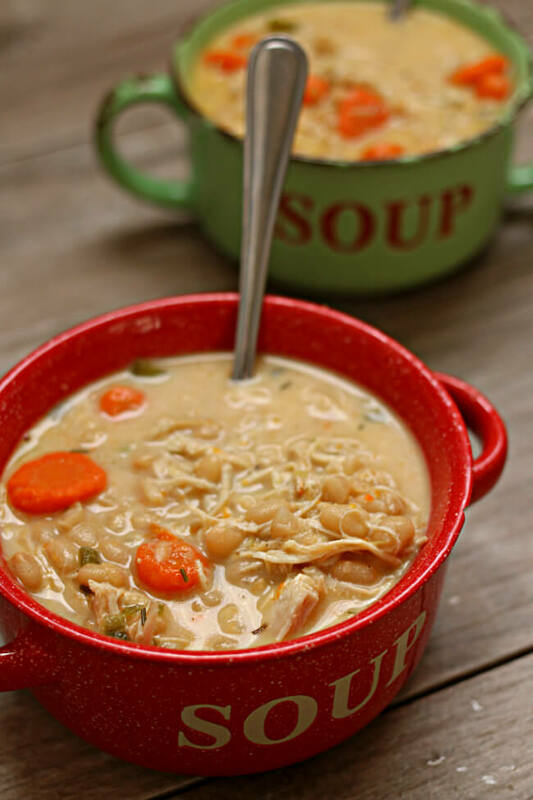 Dried navy beans are slow cooked with onion, garlic, spices, carrots, celery and chicken (or you can use turkey). You can make it creamy or dairy free (it’s up to you). For cold nights this soup is a 10 out of 10! Add all ingredients except for the half and half into the slow cooker. Cover and cook on low for 8-10 hours, or until beans are tender. Use tongs to remove the chicken and place it on a cutting board to shred. Add shredded chicken back into the slow cooker. Warm your half and half before adding it to the pot so it doesn’t curdle. I do this by putting it in a glass measuring cup in the microwave for 1 minute. Add the warmed half and half into the slow cooker. Stir. Taste test. Salt and pepper to taste. You can also use 4 boneless skinless chicken thighs in the place of the breasts. Or you can use cooked chicken or turkey (about 1 pound). Just add the cooked meat in after the beans have cooked. Another idea is to add cubed ham. Ham is salty though so you’d probably want to cut the salt down to 3/4 tsp. 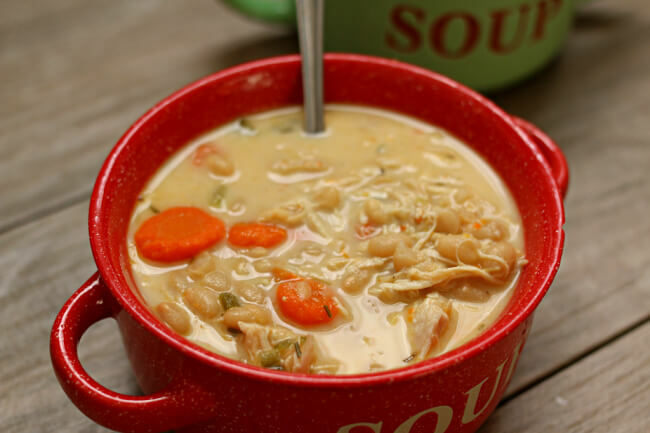 Like this recipe for Slow Cooker Chicken and White Bean Soup? Get all my new recipes delivered to your email inbox by signing up below. Overall, this is a good recipe but the flavor wasn’t there for me. I followed the instructions, using coconut milk (dairy free). I feel like the seasoning/spices need increased just a tad the next time. My mom, who doesn’t really season anything, really enjoyed it. I’m glad you mom liked it!